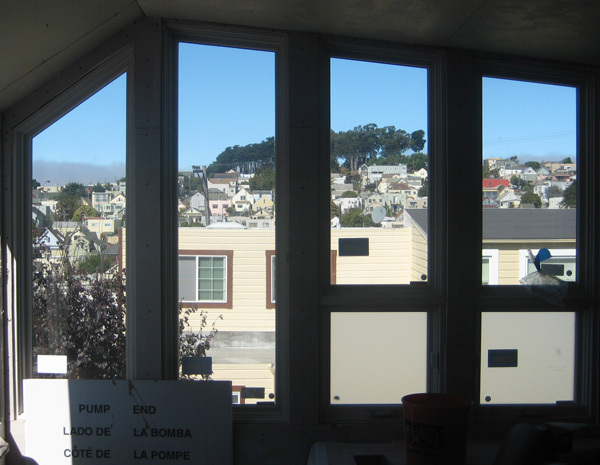 The whole-house remodel in Laurel Heights is sailing along… Above, a view into the kitchen space with the new angled ceiling we achieved by pushing up into the 30″ of empty attic space above. The new stairs to the lower floor are on the left. 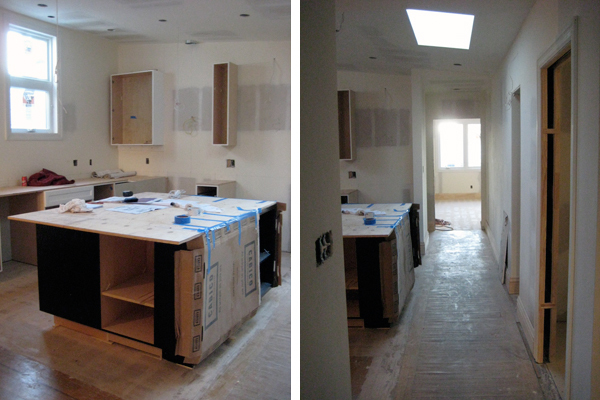 A few weeks later and another view into the kitchen and down the hall with new skylight; cabinetry by Cabinets & Beyond. The island will be a dark finish contrasting with the perimeter cabinetry. Windows are from Andersen. 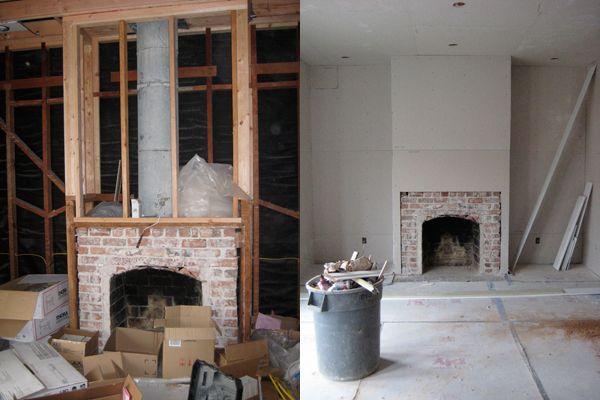 Here’s how the fireplace in the living room looks now, actually looks good as just brick! But it will be tiled over soon. The master bathroom looking toward the tub / shower combined area, over the course of a month or so. 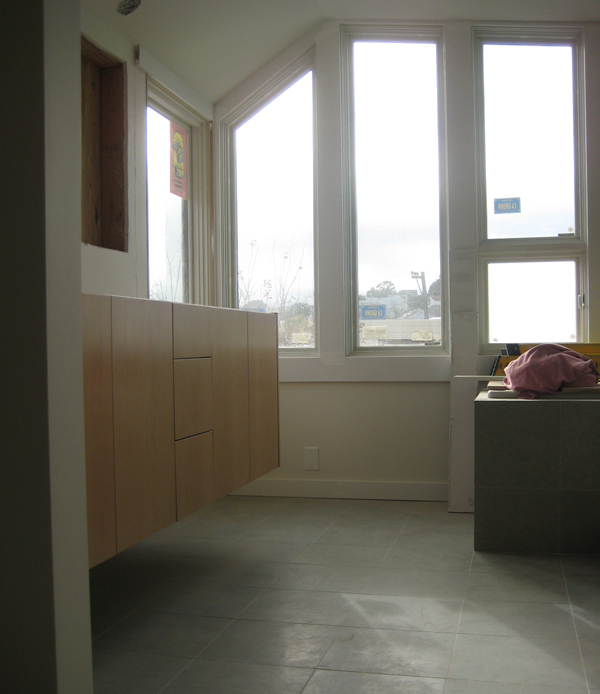 This was formerly a split bathroom (toilet separated from sink/tub) like many older San Francisco homes have. 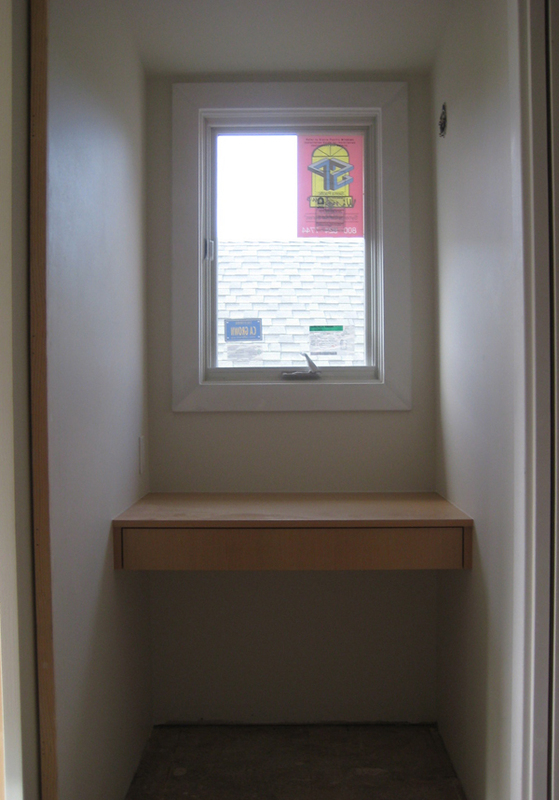 There’s a new skylight above, and the window at the tub will have a privacy film put on it. 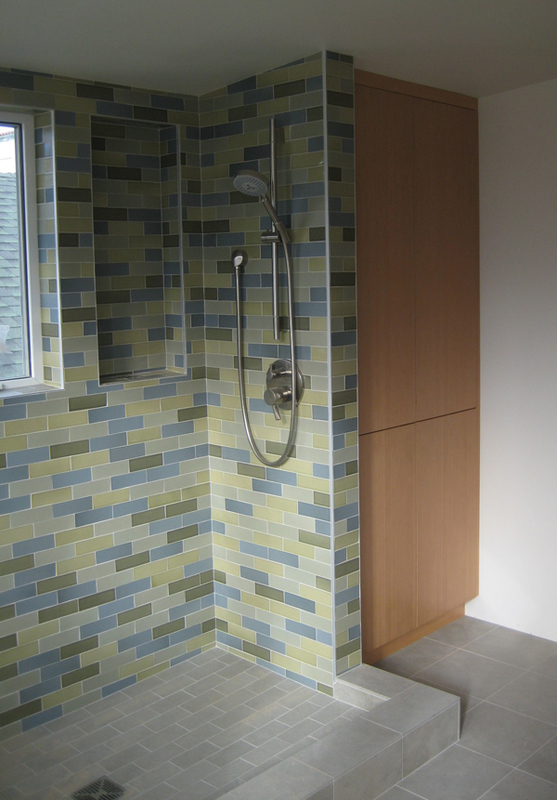 The 1×1 mosaic glass tile is Oceanside “Veil”; we chose this as part of a fairly neutral palette in this room, along with 12×24 porcelain floor and wall tiles. This is the walnut vanity cabinet for the master bathroom built by Stephen Day Design. The pullout storage on the end was dreamed up by the homeowner so she can have a place to hide toilet paper rolls facing the toilet, and additional storage facing the sink area! 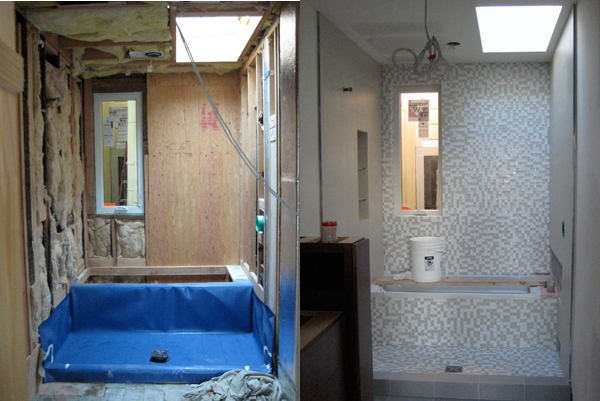 It’s great to have clients who step in to help design their space (often seems to be in the bathroom!). 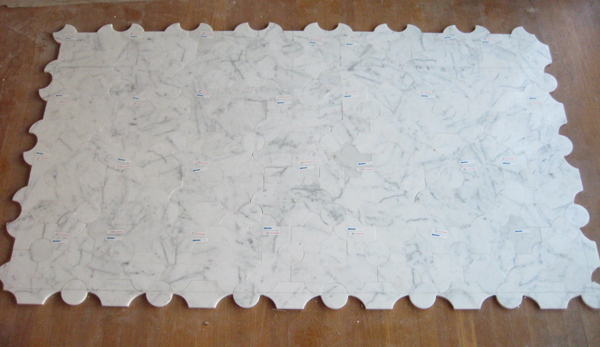 The floor tile for the powder room is Italian Calacatta marble from Ceramic Tile Design. The pattern came arranged on a backing, and will be trimmed down for installation. 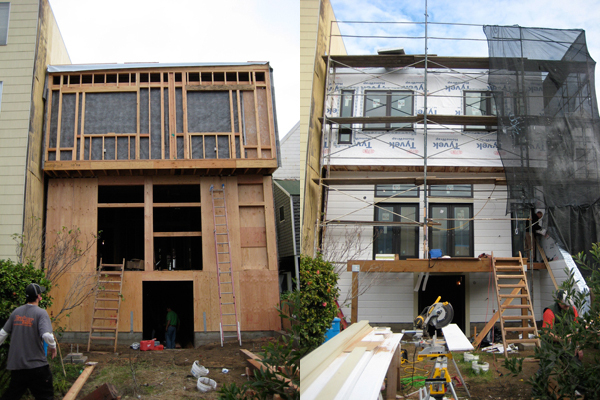 The back of the house with the squared-off upper floor with asymmetrical windows in the bedrooms. The lower floor was opened up with french doors and atrium windows over the doors (high ceilings down there!) which will open onto the deck. The basement has a pair of doors into it. More to come! [Photos taken from toddler eye-level.] Among other finishes, the custom cabinets were installed in the master suite remodel this week – now it really starts to take shape! 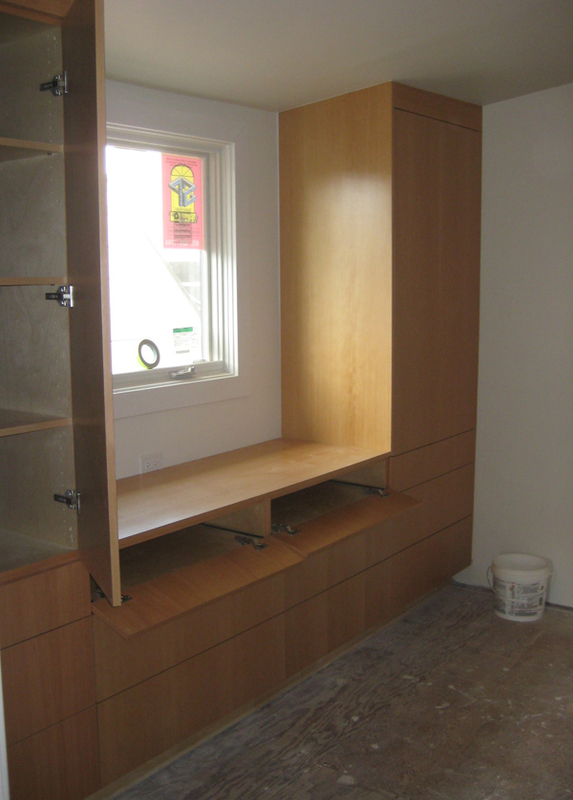 These are vertical grain douglas fir cabinets by Perfect Fit Cabinet Shop in Redwood City. They’re a shop with really great guys who do all custom work – no website yet. I love the clean look of cabinetry before the handles/pulls are installed…I better choose wisely so it doesn’t look too busy! Countertop being installed next week. 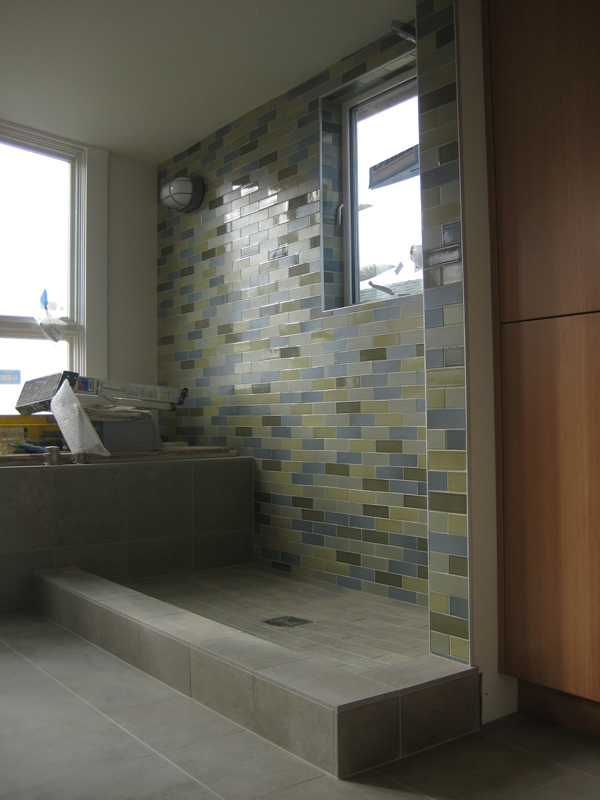 The shower tile was installed – a mix selected by the owners and I from Heath Ceramics. I think it almost has a camouflage color scheme, with blue thrown in! 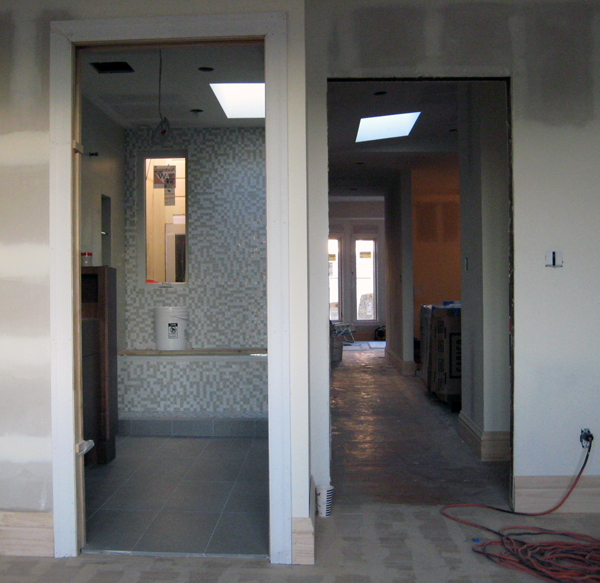 Glass enclosure to be installed soon… The floor tile is ‘bateig blue‘ limestone, from Ceramic Tile Design. Weird shadows going on here… A simple built-in desk at the top of the stairs, between the bedroom and bathroom. The bedroom built-ins have flip-down storage spaces at the top so the remotes (clickers) will work with the dvd, cable etc from across the room. Bamboo flooring being installed tomorrow! 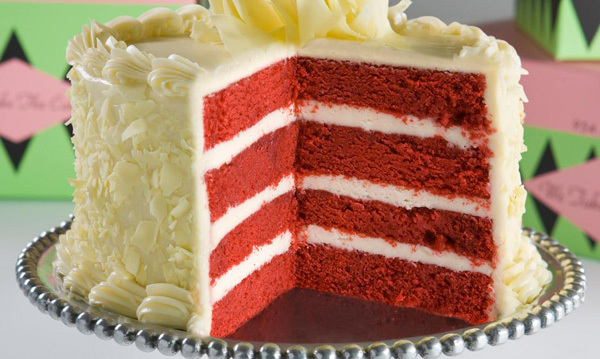 I couldn’t help but think that slicing into a house is much like cutting into a cake, the inner layers and color are revealed. 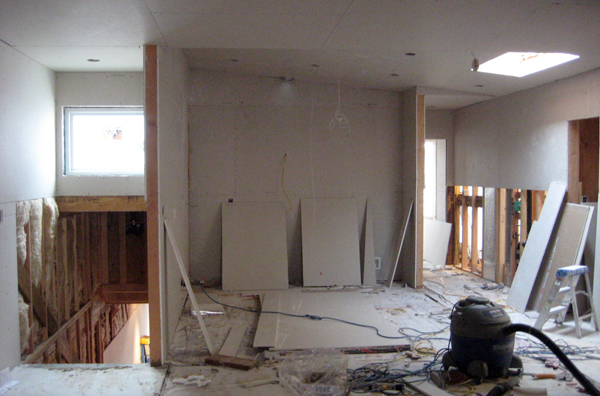 It’s been a while and much progress has on the master suite remodel. (are we in the final stretch?) 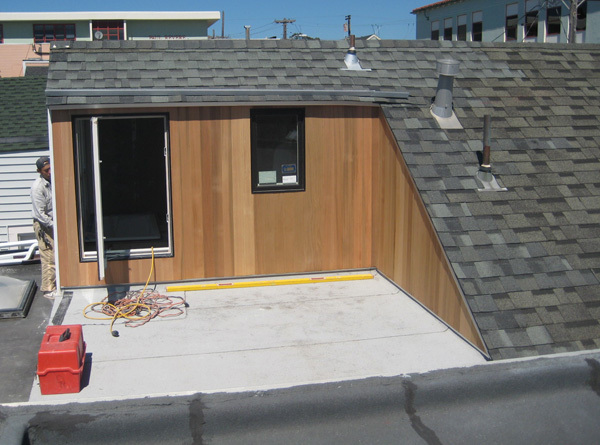 The exterior is starting to shape up, windows installed, new cedar siding at the ‘cut / slice’ area, and Hardie plank siding around the rest of it. The interior has been sheetrocked (actually painting has started this week but no photos yet) and all windows installed: why would a view like this be blocked? 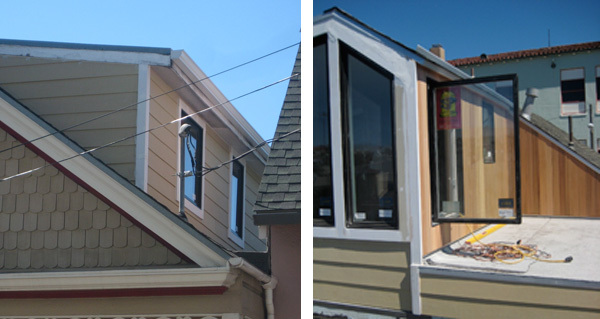 I found 2 options to put on the 2 left windows up to the same line as the 2 right for waist-level privacy: either Gila or 3M via Window Solutions. Holly Park in the distance, and fog creeping in on the left. 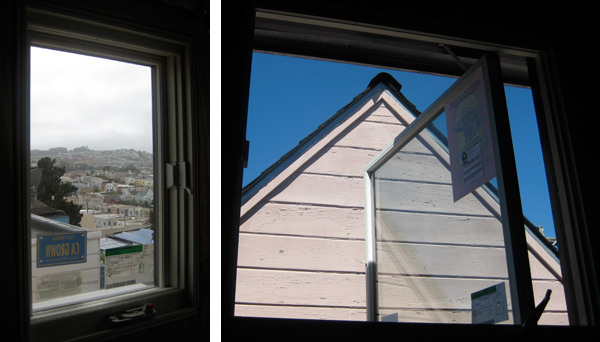 The distant view out of the vanity window on the left, and on the right, the more immediate view outside the bedroom window: well at least the bedroom now has a window = light, ventilation, escape! View below, from the bathroom. 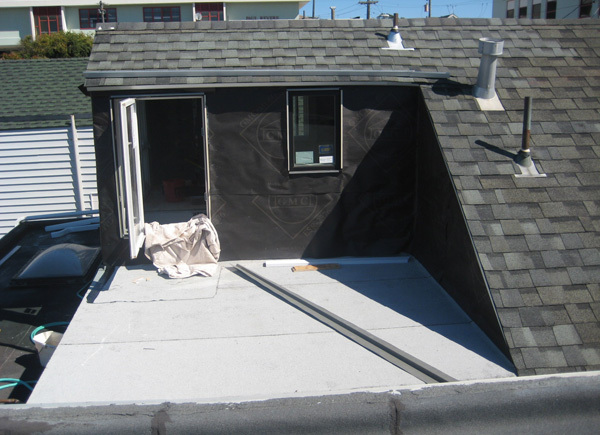 Unpainted dormer and windows. 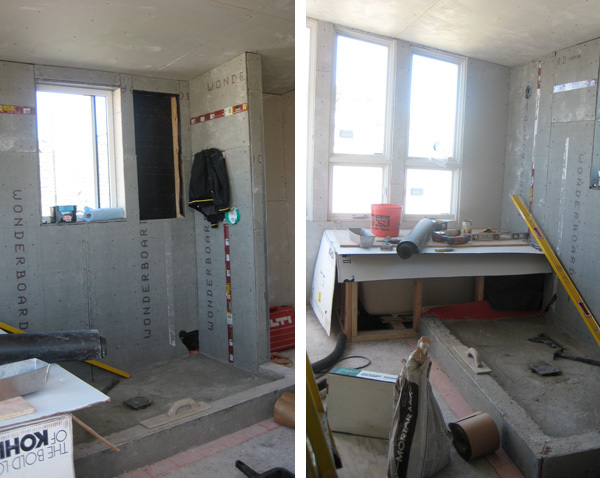 ‘Wet area’ shower / tub have wonderboard and are ready for mud, tile, grout. – More to come soon!